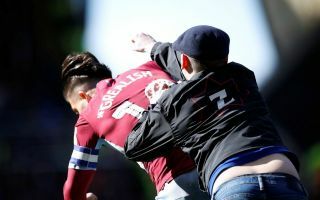 The Birmingham City ‘fan’ who attacked Jack Grealish during Aston VIlla’s win at St Andrews on Sunday has reportedly received death threats. Paul Mitchell has since been named by police after being arrested following his moronic and disgraceful assault on Grealish in the first half of the Second City derby on Sunday. The 23-year-old was attacked from behind as the ‘fan’ evaded stewards to get onto the pitch and went straight for the Villa captain. Fortunately, Grealish escaped without any injury and went on to score the winning goal in the second half to ensure it was a good day after all for himself and Villa. However, as noted by The Sun, it’s been reported that Mitchell has now received death threats in the aftermath of the incident, as per a source at his place of work, while he will appear in court on Monday to determine what punishment is handed down to him. His actions have absolutely no place in the game, and it’s hoped that extra security measures are put in place in future to avoid a similar scenario from happening. Nevertheless, two wrongs don’t make a right and it’s hoped that the situation doesn’t escalate for him and his family, as he should rightly face punishment relating to football with Birmingham releasing a statement immediately after the game insisting that he is now banned for life. So having now been denied the chance to watch his team play again, coupled with looking very silly in front of the nation and seeing Grealish go on and produce the perfect response, it’s fair to say he had a nightmare on Sunday.